This is not the latest version of Visual Studio. To download the latest release, please visit the current release notes for Visual Studio 2017. To download Visual Studio 2013 Update 2, click on the download button. The files are downloaded from our free Dev Essentials subscription-based site. Please see the Dev Essentials page for information on our free comprehensive developer program and services. This release included new features for creating apps targeting Windows Phone 8.1, the ability to build universal Windows Apps targeting the Windows Runtime, TypeScript 1.0 RTM, and many other new capabilities. With the release of Team Foundation Server 2013 Update 2, we continue to bring new ALM features, bug fixes, and other improvements to our on-premises customers. 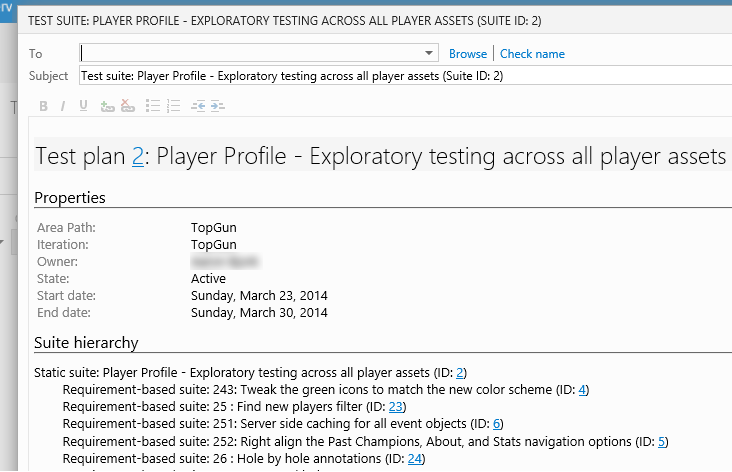 Below is a summary of the most popular features in this release, and relevant links where you can learn more. 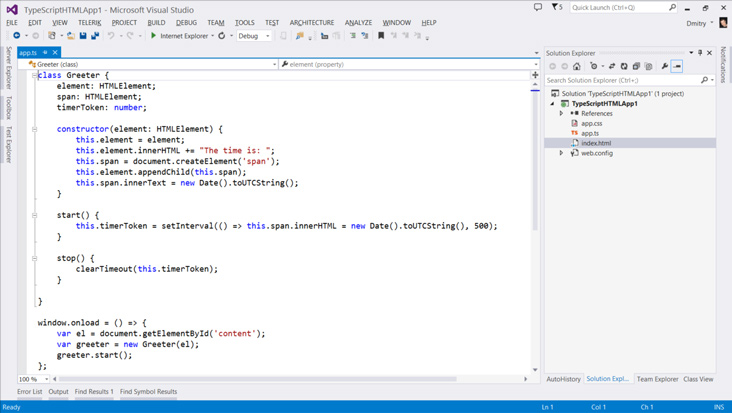 The CodeLens feature in Visual Studio Ultimate provides developers with a heads-up display for finding information quickly without having to leave their code and offers insights from various available Indicators without losing code context. In this release, CodeLens gains a new Incoming Changes Indicator that provides insight on changes occurring in other branches to the code another developer is currently working on. This enables teams working with multiple branches a new and easy way to stay informed without having to leave their code editor window. Work Item Tagging is defined by a user and adds meta-data to a work item that enables a quick way to filter data without having to create queries or additional custom filters. With this release, tagging gets even better. View and edit tags right from Visual Studio, or use them as part of a work item query for both the "Contains" and "Does Not Contains operators" (in both Visual Studio and Web Access). In addition, when opening work item queries in Excel (for things such as bulk editing of items), you can now view and manage tags right from the connected spreadsheet. When working with Kanban boards, Team Foundation Server is a great tool to visualize the current project state because it automatically maintains a Cumulative Flow Diagram as items are moved on the board. In this release, we added the ability in response to customer requests to set a new start date for Cumulative Flow Diagrams that restarts the diagram's calculations based on the new start date. In Team Foundation Server Web Access, agile teams are able to use burndown charts as a graphical representation of remaining work versus the time available in a sprint. In this release, we added a new team setting for configuring working days for a project team, effectively providing the ability to remove weekend days from burndown charts (a highly requested feature on the Visual Studio UserVoice). The work item charting feature in web access give users the ability to quickly view the status of work-in-progress by charting the results of a flat-list query. You can create several types of charts such as pie, bar, column, or stacked column for the same query. In this release, we made charts even more useful by enabling the pinning of charts to a team or project's home page; making it simple to keep everyone informed on the data points the team finds most valuable. 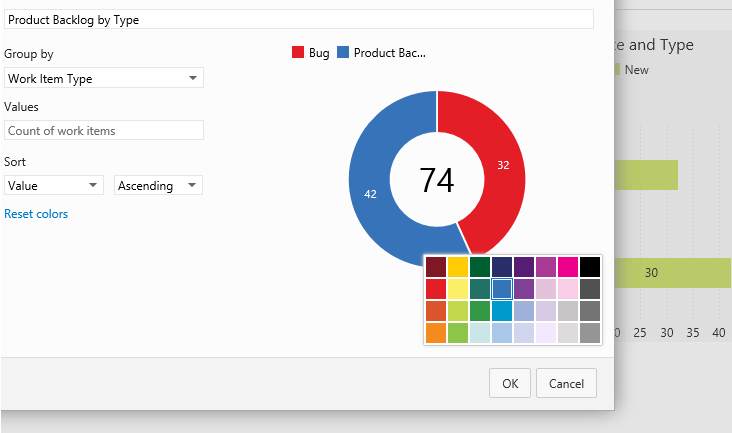 In addition, we also enabled customizable work item chart series colorization through a simple to use color picker, as shown below. Creating, managing, and executing manual tests from the browser is possible using the web-based Test Case Management feature of TFS web access. In this release, we added a new feature for exporting test plans, test suites, or test cases together with their respective properties to an HTML file for various offline uses (such as sharing with others over email or easier printing). 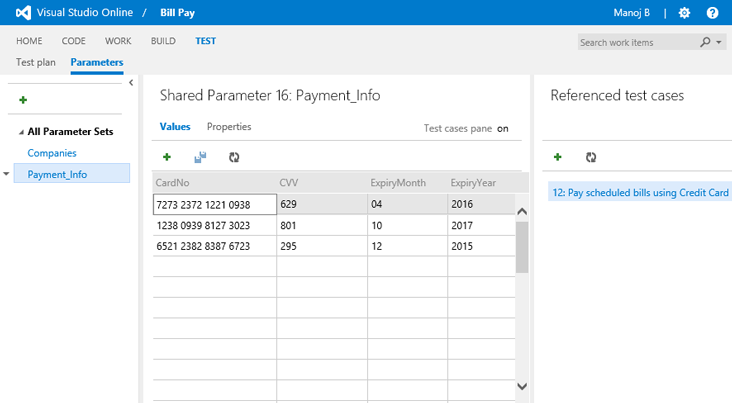 In addition, we added a new feature called "Shared Parameters" that enables sharing of Test Case Parameters by consolidating similar parameter data in a single location and referencing it across multiple test cases. No matter the size or complexity of a project, Source Control plays an important role in helping maintain control of changes made to source code over a period of time. With Team Foundation Server 2013, you can select from two type of source control options for your new team project: TFVC or Git. When running Team Foundation Server (TFS) on-premises, Team Web Access provides a browser-based UI for use by any member of the team without their needing to install any additional software. This web interface provides access to capabilities across TFS that includes, but is not limited to, Source Code, Backlog Management, Builds, and Web-based Test Case Management. In this release, we revamped the Team and Project home pages with a more visually appealing design that makes better use of screen real-estate on wider screen resolutions. Thanks to customer feedback, we also made improvements to performance when navigating the backlog in the web interface. 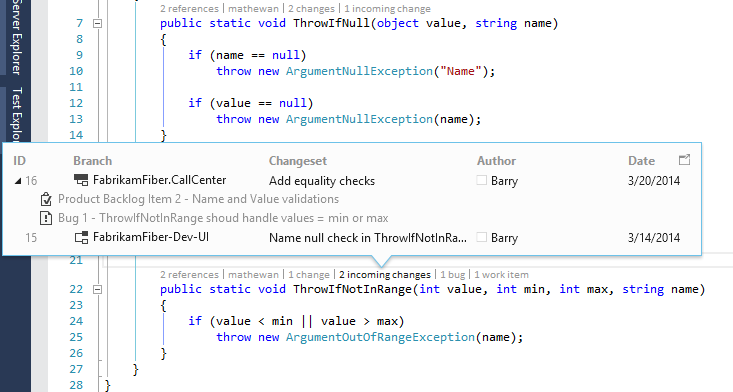 For a full list of changes, see the Visual Studio Update KB Article. Today, the Windows team announced major updates across Windows and Windows Phone, including new developer platform capabilities in Windows Phone 8.1 and the next major step toward platform unification with universal Windows apps for a common Windows runtime across phones, tablets, and PCs. For more details, visit the Windows Development Center and learn all about this new release. In this release, we are announcing that TypeScript has reached version 1.0 (RTM), bringing the language to the first official release after 18 months of development and much excitement from the developer community. In this release, we added new profiling tools and made improvements to the debugger, .NET Managed Memory Analyzer, IntelliTrace, Performance, Diagnostics hub, and much more. Graphics Frame Analysis collects performance measurements on captured frames; in addition, it also performs a set of pre-defined experiments that provide insights into how performance would be affected when various texture techniques are applied. frame analysis also collects performance counters from hardware and works the same way on windows 8.1 and Windows Phone 8.1 devices. Note that graphic frame analysis relies on a timestamp query which was not provided with Windows Phone 8. With our new consecutive capture capability, you can now capture up to 30 consecutive frames with one capture. Programmatic capture enables automatic capture that is triggered programmatically. This is useful for debugging compute shaders in programs that never call Present, or when a rendering problem makes it difficult to anticipate a capture in manual testing but that can be predicted programmatically by using information about the state of the app at runtime. A new Draw Calls view has been added that displays captured events and their state in a hierarchy organized by draw calls. You can expand draw calls to display the device state that was current at the time of the draw call; and you can further expand each kind of state to display the events that set their values. 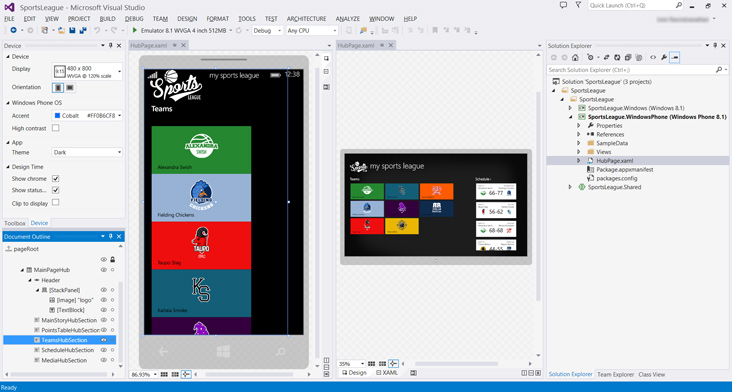 Graphics Debugger now fully supports debugging Windows Phone 8.1 apps in a phone emulator or a tethered phone. For web developers, this release includes new features and improvements for tooling and platform, including updates for ASP.NET MVC, Web API, and Web Pages. 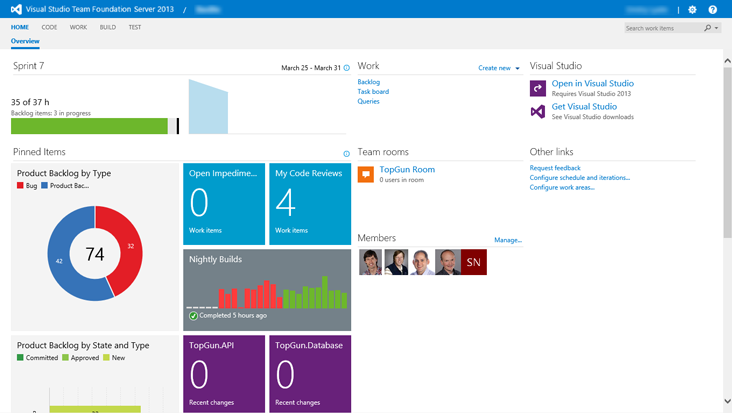 There are also improvements for web developers getting starting with Microsoft Azure.